Britain's oldest wild bird has been found on an island off the coast of north Wales. A Manx shearwater, which was first tagged in 1957 and is believed to be 52 years old, has been found again on Bardsey Island by experts. The small black and white gull-like bird could have flown up to five million miles in its life on seasonal migrations between Bardsey Island and South America, where it spends its winters. The warden at Bardsey Bird Observatory discovered the bird while surveying the island's returning population. After first being ringed in 1957, the bird was captured again several times and had new rings put on in 1961, 1977, and this year. Bardsey is one of a network of bird observatories around the country, and has had a station there for 50 years. Mark Grantham from the British Trust for Ornithology said the island was an important seabird colony. "Observers carry out standardised recordings and counts of migrating birds. "It gives us a handle on how populations are doing," he said. "We actually caught the bird last year, and then it was competing with a fulmar from the Orkneys for the title of oldest bird, but as we've recorded it this year it's now winning." 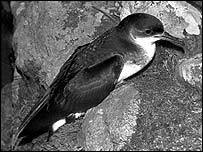 He said it was difficult to assess an average lifespan for a Manx shearwater. "Seabirds tend to be long-lived. In most birds, if they survive their first or second year, they're more likely to live till about 15 or 20." Other birds, such as ostriches, emus and albatrosses have been known to reach a ripe old age. There have been cases of puffins living into their mid-30s while an albatross and a Fulmar have both reached 40. Britain is a summer home to 95% of Europe's Manx shearwater population, with a sizeable amount choosing Bardsey as a nesting site. The birds, which are nocturnal, burrow in the ground and will return to the same burrow or one nearby to raise one chick each year. Mr Grantham said there were not that many reports and recordings about shearwaters because they spent a large part of their time far out to sea off South America in the winter. They also travelled a long way to find food while they were on Bardsey - for example, they might fly to the coast of France to find something to eat. "They don't see land very often, certainly not in the daylight," he added.